On paper, President-elect Barack Obama's choice for United Nations ambassador has much in common with another boundary-breaking, African-American, Stanford-affiliated, female foreign policy expert with the same surname. But the similarities with Secretary of State Condoleeza Rice end there. Susan Rice brings to the U.N. job a career devotion to African affairs and eight years of experience in the Clinton administration.  Age 44, Rice is married to Canadian journalist Ian Cameron, executive producer of ABC's This Week with George Stephanopoulos. They met in college when she was a freshman and he was a senior and are the parents of two children.  She's a Washington, D.C. native and the first African-American woman named as U.S. ambassador to the U.N.
 Her father, Emmett Rice, was a governor of the Federal Reserve System. Her mother, Lois Dickson Fitt, is an academic scholar whose parents were born in Jamaica. Raised in a household that stressed education and public affairs knowledge, when Nixon resigned from office, a 9-year-old Rice was the one who told her parents the news.  She attended the prestigious National Cathedral School, an all-girls academy. She was a star point guard on the basketball team and was known as "Spo," short for "Sportin'." She also lettered in two other varsity sports, and was president of the student council and valedictorian of her class.  She earned her bachelor's degree from Stanford University went on to earn a Rhodes Scholarship to study at Oxford, where got her master's degree and wrote a doctoral dissertation on the transformation of white-ruled Rhodesia into black-ruled Zimbabwe. While a college student, she launched a divestment effort to protest South African apartheid. After earning her Ph.D. at age 25, she briefly worked as a consultant for McKinsey & Company.  In her mid-20s, she worked as a foreign policy aide to Michael Dukakis during his 1988 presidential run. She later worked for John Kerry's 2004 campaign and was a senior foreign policy advisor to the Obama campaign.  Rice was Clinton's top Africa diplomat when al Qaeda bombed the U.S. embassies in Tanzania and Kenya, which led to her first middle-of-the-night official phone call  from Kenya's ambassador alerting her to the attacks. Working for Clinton's National Security Council, she also dealt with issues related to the 1994 Rwandan genocide, including the president's widely criticized decision not to intervene. In 1995, she was appointed the NSA's lead Africa expert; she became pregnant with her first child while in the post and didn't take leave until one day before her son was born. She later served as assistant secretary of state for African Affairs in her early 30s. After leaving the state department, she worked as a senior fellow for the Brookings Institution.  According to an article in the Stanford alumni magazine, while an assisant secretary of state, Rice once listened as Nigerian opposition leaders praised a recent tough speech she had given, completely unaware that the 5-foot-3, 33-year-old Rice was the one who had delivered it. 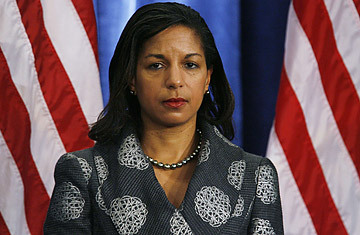 Rice waited until the discussion had ended, smiled and introduced herself, shocking the men.  Former Secretary of State Madeleine Albright is a longtime family friend and mentor.  "If I were to characterize her, whether it's playing basketball or anything else, she's fearless."  "It may be splendidly progressive of Clinton to place his Africa policy in the care of relatively young women ... On the other hand, he's utterly ignorant of a cultural reality."  "Susan knows the global challenges we face demand global institutions that work. She shares my belief that the U.N. is an indispensable and imperfect forum."  "Susan certainly is tough, and she's tough in exactly the right way."  "I am very aware of being black and female because that's what I am. And I think it is very important for other black students to be aware of the scholarship program and see it as a good opportunity for them."  "We see human rights and democracy not only as the expression of universal values, but as the only means of achieving the goals of long-term political stability and sustainable economic development on the African continent."  "I was conscious of the fact that it could be to my disadvantage to marry a white guy  that some folks would hold that against me ... But why the hell should I be constrained by prejudices with which I totally disagree anyway? ... That doesn't mean I am any less of an African American."  "You cannot describe what it is like to see thousansds of bodies rotting in one place. Shot, hacked up, dead, decaying faces. People frozen in whatever position they might have fallen  babies in mothers' arms."  "The battle we face is not of Republican versus Democrat but of the indifferent versus the committed."